This month’s community spotlight is, as always, a little bit different. 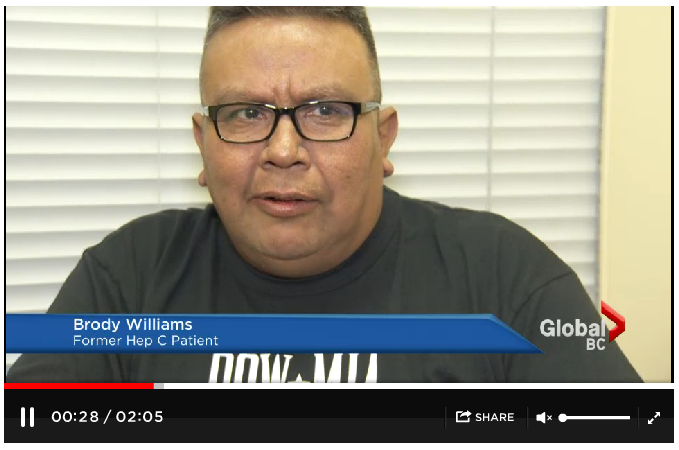 One of our beloved friends at VIDC, Brody Williams, recently appeared on Global News as a success story — Brody has finally won the battle against hepatitis C after six (6) different treatments! Brody’s story is filled with a lot of ups and downs. He’s been struggling with the disease, the illness, the effects of the medications, the stress and financial burden of the disease and treatment, etc. This interview is Brody’s way of waving his flag at the top of a mountain after all the hardships he had to deal with to reach the summit! After everything he’s been through, Brody is determined to help others out. He’s been very passionate in attending and providing insight and support to other patients at our HCV Treatment Support Group. Now that he’s officially cured, he is all the more determined to help others succeed in their battle against HCV. He’s currently still very actively engaged in our HCV Treatment Support Group and is looking into other avenues to better help other out. The article on the Global News website also tackles one of the biggest issues facing HCV Patients — treatment cost. Click on this link to read more about it. Brody, we look forward to continue working with you in bettering the HCV situation in Vancouver — and in Canada! July 28, 2015 is the official World Hepatitis Day 2015. 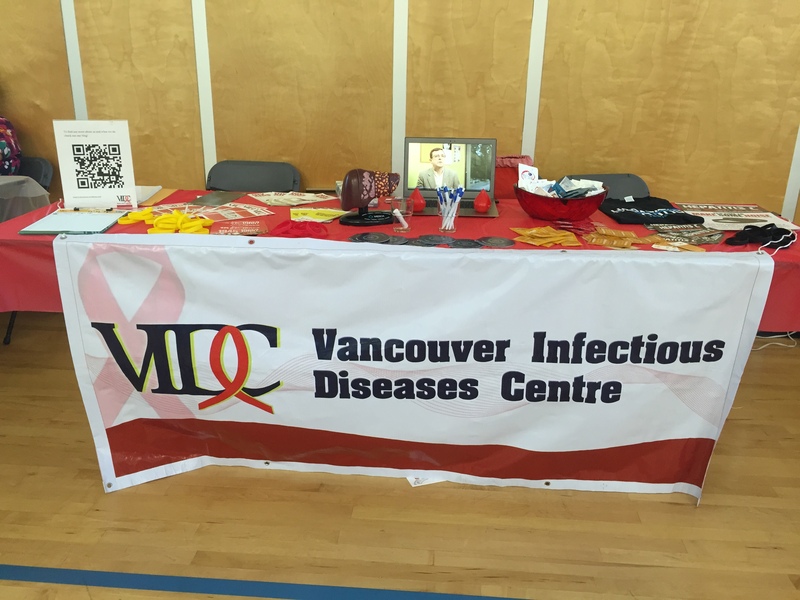 As such, the British Columbia Centre for Disease Control (BCCDC) organized the World Hepatitis Day Event for Vancouver on the that day at the Creekside Community Recreation Center. Various organizations came together at the event to bring awareness to the threats of hepatitis and the advances we have made against them. There were also guest speakers lined up for the day, from patients who have lived with hepatitis, to health care professionals discussing the advancements made to combat the disease. And, of course, VIDC had to be there! As part of our commitment to a community-based holistic approach to treatment, being at the World Hepatitis Day event is our way of engaging and learning from the community. Pictures speak louder than words! Check out the photos below to find out how else was VIDC involved at the event. 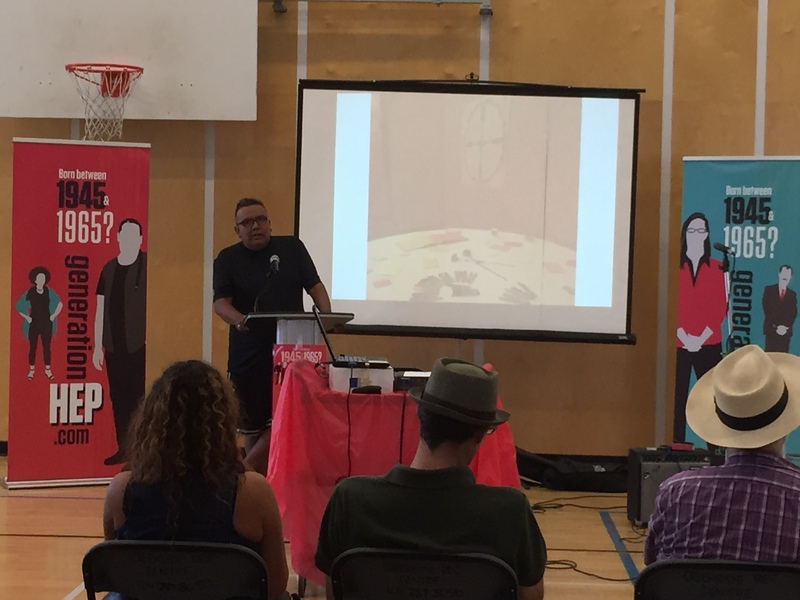 We also had our Community Pop-Up Clinic(CPC), with the support of the First Nations Health Authority, set up! You might remember Brian from when we did Liver Screening at the Gathering Wisdom event. 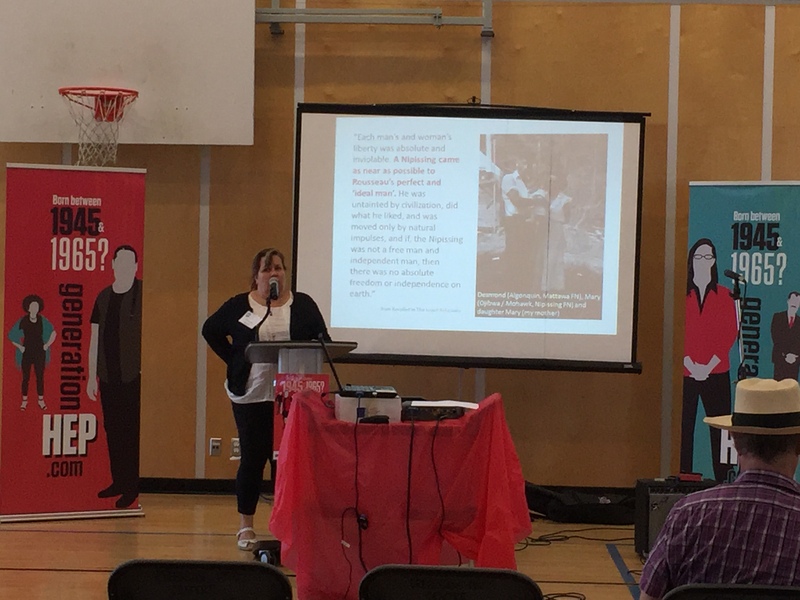 Our staff physician, Dr. Alexandra King, also gave a talk at the event bringing awareness to the importance of access to testing for HCV — especially for the indigenous community. One of our long-term patients, Brody Williams, sharing his experiences with hepatitis C — from the struggles of gaining access to treatment, to the success story of how he has battled the disease. 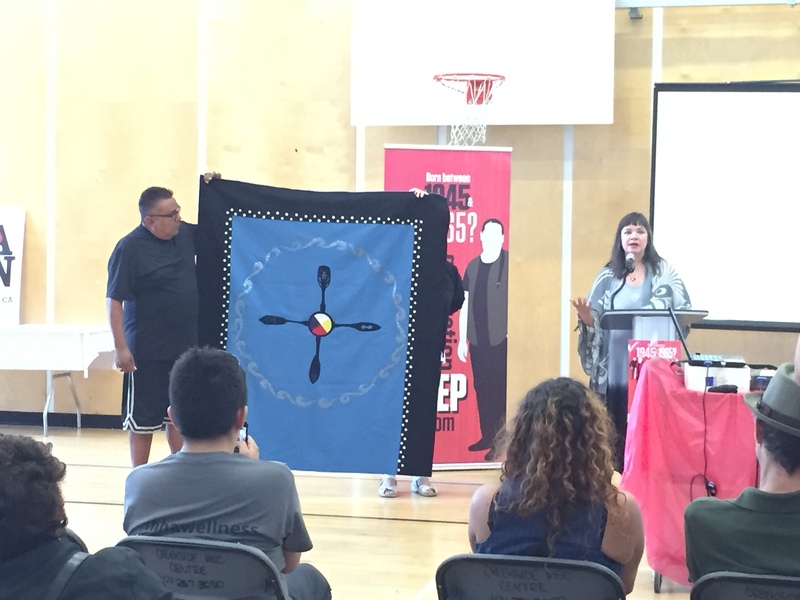 Elder Sharon Jinkreson Bass, Brody Williams, and Dr. Alexandra King also unveiled the Hepatitis C Water Journey Blanket. An homage to the AIDS memorial quilt. It is through events like these that communities are brought together to teach and learn from each other. And it is through these events that allies are brought together to fight towards a common goal: health and wellness. 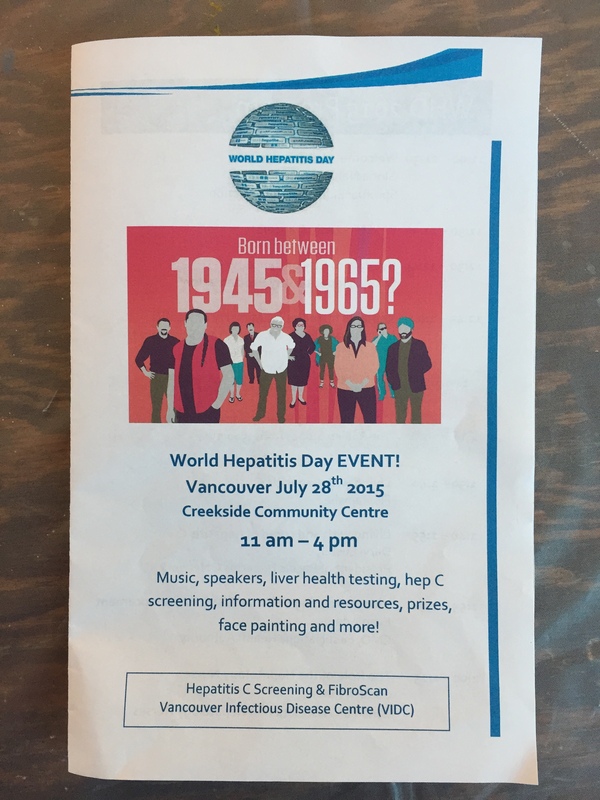 To see more photos, check out the HepC BC’s post on World Hepatitis Day Vancouver 2015.